Our gorgeous Christening necklace with delicate diamond floating heart is shown here in sterling silver with a genuine diamond in the centre, Perfect as a special keepsake jewellery gift for a very special girl's Christening day. Engraved jewellery: to personalise this gorgeous keepsake jewellery gift we can engrave the back of a sterling silver heart tag (measuring approx 1.3cm x 1.3cm), with names / date / messages on the front and back of the tag (maximum 40 characters on each side). Please check below for up to date dispatch information for personalised engraving and also for non personalised jewellery gifts. If you need your order more urgently please do let us know email: sales@lovelulabula.com for dispatch information or for help choosing the perfect Baptism / Christening gift. 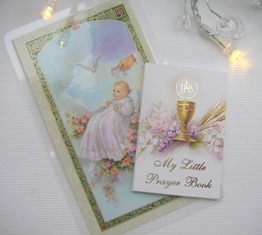 Every wonderful Christening jewellery gift comes with a personalised Christening card, a gift box that can be personalised with your own message added inside the lid, wrapping paper, ribbon, a Christening prayer card and a little prayer book. 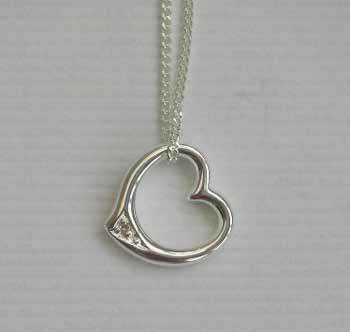 Creating the perfect keepsake Christening jewellery gift beautifully packaged.